Former NFL scout Daniel Jeremiah runs MovetheSticks.com, an invaluable resource for fans looking for insight on football talent evaluation, in addition to the buzz among pro personnel executives. Since January, he has been all over the airwaves and Internet providing analysis of the prospects in the 2010 draft class. With less than a week to go until round one, Jeremiah graciously agreed to talk with Blatant Homerism about the Oklahoma Sooners who are most likely to hear their names called next weekend. 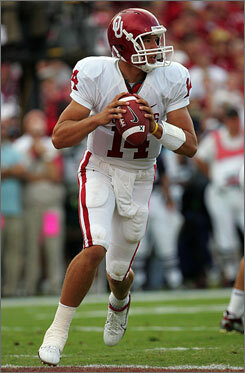 As many as four OU players appear destined for the first round, including quarterback Sam Bradford, the 2008 Heisman Trophy winner who looks to be top overall pick of the St. Louis Rams. From the sound of it, he shares the draftniks' consensus opinion that this is a bumper crop of Sooners. Blatant Homerism: What is the general perception of Oklahoma's program among NFL scouts and personnel executives? Do Bob Stoops and his staff do an adequate job preparing players for the pros? What about when it comes to helping scouts with the evaluation process? Daniel Jeremiah: Oklahoma is one of the best college visits for NFL scouts. They are wide open with their practice schedule and are very forthcoming with information about the prospects. Coach Stoops has done a great job of preparing these players for the next level. They practice at an NFL pace and most of their players have a real toughness about them. It is a fantastic program. BH: The consensus seems to be that Sam Bradford is the Rams' guy at No. 1. Is he a No. 1 caliber prospect, especially in a class loaded with some standout defensive players, such as Nebraska's Ndamukong Suh? Jeremiah: I do believe that Bradford is a No. 1 caliber-type player. In my opinion, he isn't the best player in this draft, but he is the best QB by a wide margin. Suh is a very rare talent at the DT position, but that doesn't mean Bradford isn't deserving of the first pick. This is 100 percent a QB-driven league, and Bradford has a chance to be a quality starter for the Rams. If five years from now Bradford is the eighth-best QB and Suh is the No. 1 DT in football, I think the Rams will have made the right decision. BH: Is it fair to question Bradford's toughness? Jeremiah: No, it isn't fair to question Bradford's toughness. With an injury to your throwing shoulder, there aren't many options. The fact that he chose to try and come back and play in the Texas game is a great example of both his competitiveness and his toughness. BH: Are the concerns about Bradford's offensive system in college legitimate? Does Jimmy Clausen's experience in Charlie Weis' offense really give him a leg up on Bradford? Who is the better prospect of the two? Jeremiah: Obviously, you would prefer to evaluate Bradford in a traditional NFL-style offense. However, his skill set is far superior to Clausen, and most teams feel as though Bradford will pick up an NFL offense quickly. Initially, Clausen will have a leg up in the meeting room. But things will even out rather quickly. BH: Can Gerald McCoy play in both a 3-4 and a 4-3? Obviously, his biggest asset is his quickness, and I think his performance on the bench at the combine raised some concerns about his strength and ability to fight off double teams. Jeremiah: I've been in war rooms for six different drafts and have yet to see a player drop because of his performance on the bench test. McCoy has excellent functional strength when you watch him on tape. I think he is plenty capable of playing DE in a 3-4, but you would be taking away his best asset. He is a dynamic penetrator. I don't see why you would want to make him play at the line of scrimmage when he is so capable of shooting gaps and disrupting an offense. BH: Jermaine Gresham didn't play a down for the Sooners this year. Injury aside, how big of a problem is it for teams that he hasn't played competitive football in more than a year? Jeremiah: I don't think his absence from this past season will drastically alter his draft status. From what I am hearing, the medical checkup went very well for him at the combine. I think he is a sure thing to go in the first round of this draft. Had he stayed healthy and had a HUGE year, he might have improved his stock by five to 10 slots. But he was already established as an elite NFL prospect. BH: How concerned should teams be about Trent Williams' discipline? With all the penalties that he racked up in his senior season, has his "nasty streak" crossed over into the realm of being more of a liability than an asset? Jeremiah: I would much rather try to rein in an offensive lineman's temper than try to instill one. There are three main reasons why Trent Williams is a lock to go in the top 10: intelligence, excellent feet and a nasty streak. Everything he needs to improve upon can be taught. BH: Does Dominique Franks have adequate skills as a man cornerback, or is he strictly a zone guy? 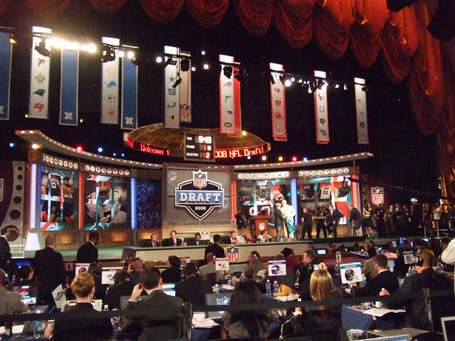 BH: Do you think there are any potential late-round sleepers coming out of OU? Guys like Brian Jackson or Brody Eldridge? Jeremiah: Eldridge is an intriguing guy. I think he has a chance to get picked late and make a roster. I like him more than Jackson.